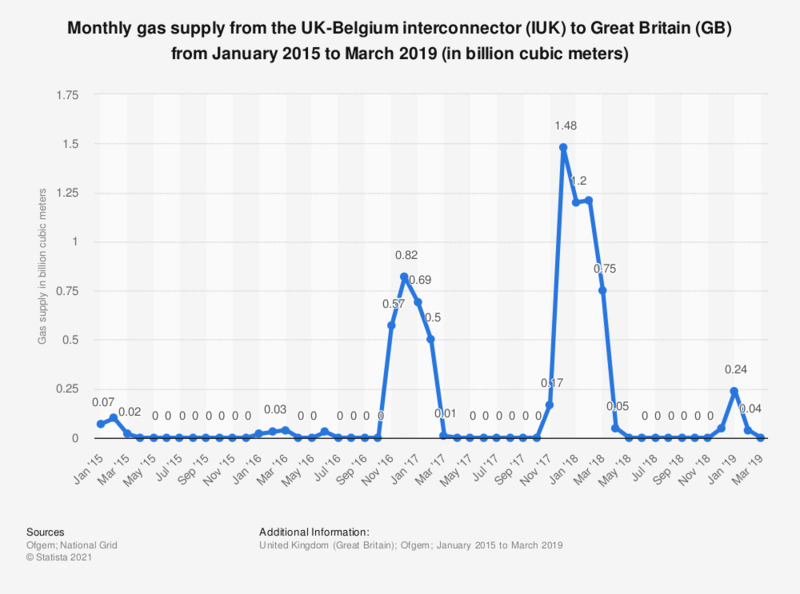 This statistic shows the gas supply from the UK-Belgium interconnector (IUK) in Great Britain (GB) by month, from January 2015 to June 2018, in billion cubic meters. It shows that the amount of gas supplied the IUK peaked a first time at 0.82 billion cubic meters in December 2016 and a second time at 1.48 billion cubic meters in December 2017. Positive values represent supplies to the energy system of Great Britain. This includes domestic production from UKCS, imports at LNG terminals, withdrawals from storage and imports via pipelines and interconnectors. Negative values represent supplies from the British system (excluding end-consumer demand). This includes injections to storage and exports via interconnectors. Great Britain has three interconnectors linking them with Belgium (IUK), the Netherlands (BBL) and Ireland and Northern Ireland (Moffat).